This is the first game in the Dragon Quest series. For other games in the series see the Dragon Quest category. 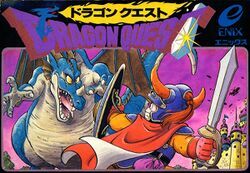 Dragon Quest (localized as Dragon Warrior in USA and Europe) was the sixth best selling Famicom game released in 1986, selling approximately 1 500 000 copies in its lifetime. It was repackaged and re-released along with Dragon Warrior II as Dragon Warrior I & II for the Super Famicom in 1993 in Japan only, and later on for the Game Boy Color (with Super GB support), which was released in Japan in 1999 and the States in 2000. Dragon Warrior is most notably remembered as one of the earliest home console RPGs of its kind. It arrived on the Famicom/NES one year before Final Fantasy appeared on the same system; both games took three years to be translated from Japanese and released in America and Europe. The Dragon Warrior series is different from the Final Fantasy series in many respects. The biggest difference is the atmosphere: while Final Fantasy portrays beautiful worlds caught in the midst of an impending catastrophe, Dragon Warrior tends to be a bit more serene with a touch of humor thrown in. Despite the differences, games from both series contain deep and intricate stories as well as hours of enjoyable game play. The first Dragon Warrior, like any first game in a series, is the most simplistic and not complex. It casts the player in the role of a solo adventurer who must solve the world's problems single-handedly. It features a number of underground dungeons, a wide expansive world, and numerous well illustrated monsters to battle; the art style of the game, and in fact most of the series, was directed by Akira Toriyama (of Dragon Ball fame). Fights are simple as well since they always consist of a one-on-one battle between you and a monster. Despite the lack of customization or strategic flexibility, Dragon Warrior is a fine example of a basic RPG, and an astounding success in both Japan where the enjoyment of a good RPG was well known, and in America where it was thought that players would not appreciate such a slow paced game. Instead, it created a fan base that has continued to support the series through the latest release, Dragon Quest IX: Sentinels of the Starry Skies on the Nintendo DS, and on to today. Localization note: in the English NES release, most names were changed; original names were restored in later localizations (GBC); this section states the original names in bold and the NES localized names in brackets. Long ago, a man named Loto (Erdrick) returned peace from the hands of evil. The peace came in the form of the sacred Ball of Light. Loto returned to the King with the Ball of Light and there were great festivals and celebrations. Eventually, Loto took his leave and was never seen again. Years passed and the people prospered, but one person was not happy with the way things were. He lived in the western mountain cave, far from the walls of Ladatorm (Tantagel). While exploring deep within the cave, he came across a sleeping dragon. Suddenly, the dragon awoke and the man was very frightened. As he closed his eyes to stop himself from seeing his demise, nothing happened. The man grew tired of waiting and threw a stick to distract it. Surprisingly the dragon picked it up in his mouth and brought it back to the man, like a dog. After that he discovered he could make the dragon do whatever he wanted. He then named himself the Dragon Lord. Suddenly a disaster occurred! Dragonlord Castle (Charlock Castle) rose from its earth grave and everyone knew this was a bad omen. A few minutes later a swarm of Slimes, Ghosts, Dragons and other monsters attacked Ladatorm and the villages across the land. Though they fought bravely, the years of peace had made the people weak. The Ball of Light and Lady Lora (Princess Gwaelin) were stolen by the Dragon Lord himself! After this terrible attack the people were terrified to walk outside again. Many men were killed traveling between places and people locked their doors at night. You could hear the Slimes scratching and mumbling along the walls of Ladatorm at night. The King fell into a deep depression over his kidnapped daughter, even though the legends told of a descendant of Loto coming to restore peace. The King believed it to be a myth until one day a scrawny looking young man appeared at the King's feet and asked permission to retrieve the Ball of Light and Lady Lora. Since many other hapless warriors volunteered and failed, The King had already given up hope. But he saw a light in this young man's eyes and knew he was the descendant of Loto. Giving various items and gold, the King sent the warrior out. Now you must guide the hero to victory and defeat the Dragon Lord! This page was last edited on 5 May 2016, at 05:36. This page has been accessed 161,839 times.